DENG Jieyin, QIN Yang, CHEN Xiaoyan, LI Gaili, LI Yunming. Relationship of Coronary Artery Calcification with Dementia and Coronary Heart Disease in Very Elderly Men[J]. Journal of China Medical University, 2018, 47(9): 820-823. Abstract: Objective To evaluate the relationship of coronary artery calcification(CAC) with the risk of death, dementia, and coronary heart disease(CHD) in elderly men. Methods Data of male patients aged 75-85 years were collected from 2004. In total, 386 men had CAC without dementia and CHD. They were grouped according to the degree of CAC(≤ 10, > 10 to 100, > 100 to 400, >400), and data were reviewed until 2016 or until their death. The results of carotid ultrasound, magnetic resonance imaging of the brain, neuropsychological tests, and risk factors for CHD were recorded. The relationships between CAC scores and the risk of mortality, dementia, and CHD and between dementia and cumulative survival rate were analyzed. Results CAC was associated with age, carotid stenosis, mortality, dementia, and the prevalence of CHD(all P < 0.001). 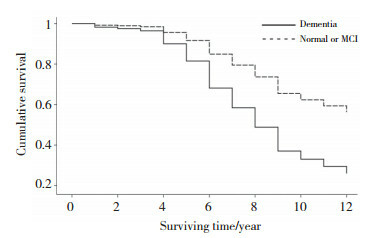 The cumulative survival rate of patients with dementia was significantly lower than that of the other patients(χ2=50.365, P < 0.001; HR=2.49, 95% CI:1.89-3.27, P < 0.001). Conclusion CAC increases the risk of dementia, CHD, and mortality. In older men, the prevalence of dementia is higher than that of CHD, and dementia significantly increases the risk of death. CAC，coronary artery calcification；CHD，coronary heart disease.